The shirts you are wearing are a very important part of you business look. It can definitely make or break your outfit. This is what is right below your face and is key on how you will be confident with your outfit. In this article we will go through a few aspects of shirts: Fit, Collar, Cuffs, and Colors and how to wear them. The general fit of your shirt will depend of your body. You need to find a shirt fit that is as adjusted as possible to your body type, you don’t want folds, as well as having seams bursting because you chose one too slim. 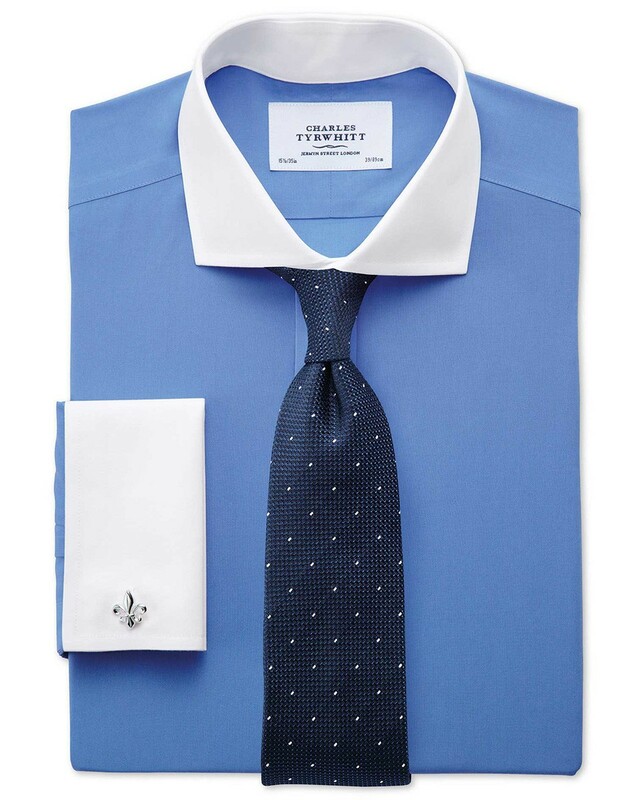 Proper shirts come in three different adjustments on sizing: Collar size, Sleeve Length and General fit. If you see sizing as S, M, L, XL… Step Away! Collar size: This is the first thing to look at, as it will determine your size. How to measure your collar size at home: Put a tape measure around your neck above your collar bone, and add one finger inside the tape, then look at the measurement. This will give you a general idea of your shirt size. Now if you have really broad shoulders, you can go 0.5″ larger than what you measured. Sleeve Length: Measure from the middle of the back of your neck, over the top of your shoulder down to the point where you want your cuff to sit. Where you want the cuff to sit? Do you feel that protruding bone on the outside of your wrist. You want your shirt to be around 1″ past that bone, right before the point where your wrist bends. If you are hesitating between two sleeve lengths, always go for the longer one. Fit: Simple on this one, if you are in need on putting on some weight, and people offer you sandwiches when they see you, go for Extra Slim Fit. If you have an athletic build, go for slim fit. If you have a few pounds to shed and the gym is calling your name, go for classic fit. There are many collars available, making choices difficult. We are going to focus on three that will work for most people. The Classic Collar, Semi Spread Collar, and Spread Collar. Those collars are about personal preference, as well as how often you plan to wear a tie with your shirts. Also, keep in mind to see if you are planning to wear your shirts a little more casually. If you like larger tie knots, I would recommend a semi-spread or spread collar, as they will give a little more room for your Windsor knot. What matters is that you need to find shirts with Collar Stays inside the collar, those pieces of plastic, or brass will keep structure within your shirt collar. Those are key, if you see shirts without those, step away. If the collar stays feel flimsy to you, you can always purchase some brass ones. We will discuss two types of cuff styles. You can either have French cuffs or Regular (barrel) cuffs. The difference between both is one uses cufflinks to close your sleeve, while the other will use buttons. French cuffs are more formal, and it would take you a few more minutes every morning to find your cufflinks. French cuffs will, however give you an extra edge that can make the difference. Regular cuffs are what you are used to, they are effective and simple. What you pick is your choice, I personally own both types of shirt cuffs as I think they both have their place at different times. Blue Shirts, are your second great option, from light to medium blue, they mostly all work. As long as you have a pattern and thickness that will make it look solid and opulent, it’s an easy one. 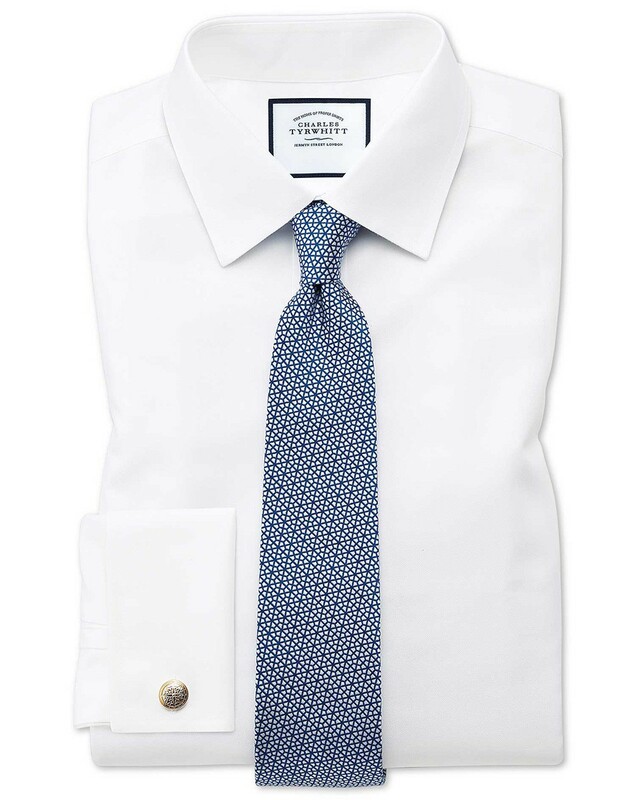 If you want to look a little more formal than usual, you can always go for the Winchester Shirt, also called Wall Street Shirt. Everyone was wearing those on Wall Street for a while, look at the Wolf movie, and you will see them everywhere. Those have to be worn with French cuffs, so you have the contrast cuffs and collar. Lilac and pale pink shirts are acceptable as well to transition a little bit from the two classic above, maybe try to find something with white In there, such as a puppy tooth or a caviar texture. I would not recommend to wear any bright colored shirt, or shirt color that is darker than your suit, such as grey or black shirts. In most cases, shirts with textures will be thicker and will look more opulent than plain thin shirts. First and Foremost, shirts have to be made in cotton, anything else than that such as man made materials will be terrible. 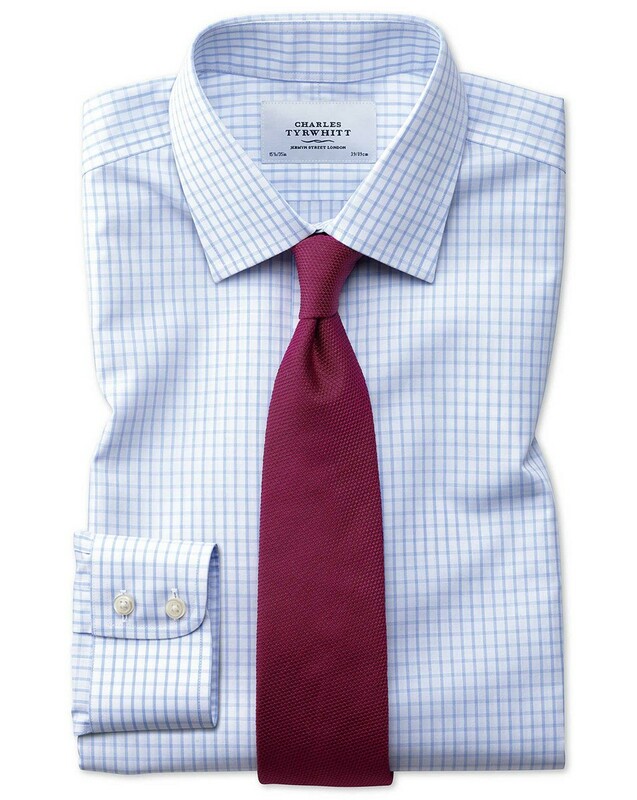 Synthetic shirt, such as Polyester, will wrinkle, will not breathe (you will sweat like a piglet) and will look bad. So make sure that anything you buy is 100% cotton. Now, not all cottons are equal, and look for Egyptian/pima cotton if possible. Now if you can 2ply or 2fold shirts, those are ideal. Also, I think I might need to mention to never wear an undershirt, a tank top or anything else under your shirt, even if it’s 30°F/0°C or 95°F/35°C, in one case layer above your suit, you’ll be fine, on the other case, double up on anti perspirant in target zones, and wear colors that don’t “show” as much, such as white shirts, and keep your jacket on. You’ll be in a room equipped with AC soon enough. How to care for your shirts: Get them pressed if you can, you can ask for extra starch on the collar to facilitate the work of your collar stays. IF it takes a little too much out of your budget, you can wash them by color, and hang them. Iron them before wearing them. Don’t fold shirts, the folds will be hard to iron out, so if you have room to hang them, do it. And if you don’t, make room in your closet. Ironing out your shirts is not easy, and I’m still impressed how a friend of mine, former US Marine (thank you for your service) would iron out his shirts, they were perfect every time. If you are less skilled, you can always try a hand held steamer, they will do quite a decent job. 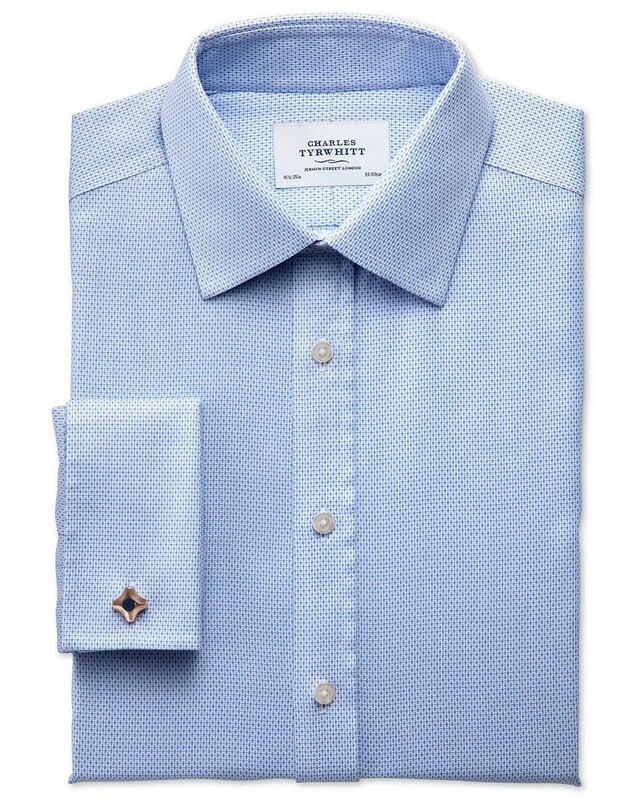 Those three stores are originating from Jermyn Street in London, and they ship shirts all over the world. You will get your shirts delivered to your house for a very cheap delivery fee in around 10 days. Those three companies have some fantastic return policies if the shirts don’t fit right, so it’s a no brainer. They also have sales quite often, so you’ll pay definitely less than in any quality department store.